It's been nearly twenty years since Cindy saw a fateful AOBA ad in a magazine. She was sold on breeding alpacas at the first Eastern Alpaca Jubilee we attended in New Jersey -- it was cold and rainy, but the alpacas looked great! 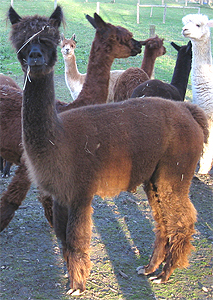 We bought our first alpacas in January of 2002 -- the pregnant Tasha and her daughter Tess. In May of that year we found our farm in Mt. Airy, Maryland, and we have since been upgrading the farm and building the herd. We never expected to have so much fun, and meet so many wonderful people! Stop by the farm sometime and meet the herd!